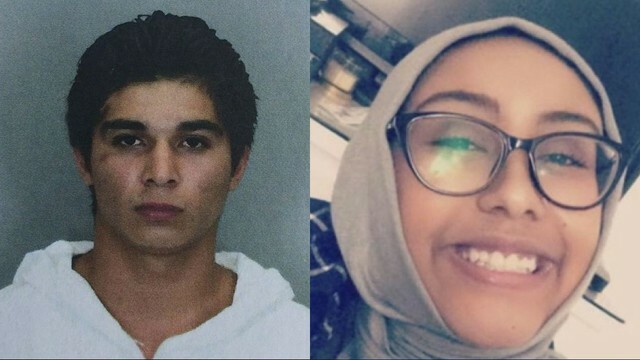 Nabra Hassanen (r) was killed by Darwin Martinez Torres (l) in what was deemed an act of road rage. Sterling – Final farewells and funeral prayers were said for seventeen-year-old Nabra Hassanen of Reston, Virginia. In a tremendous outpouring of support and compassion, nearly five thousand American Muslims, family and friends gathered at the All Dulles American Muslim Society Center where the funeral service and prayers were held June 21. The family of the deceased girl are now represented by a legal team from the Council on American-Islamic Relations (CAIR), who are closely following the ongoing investigation of the Fairfax County police. Investigators stated their initial conclusion that the girl’s murder by a 22-year-old undocumented immigrant was the result of a ‘road rage’ encounter. The victim’s parents emphatically stated that they believe their daughter was murdered because of her dress ( an ankle-length garment and hijab) that identified her as being a Muslim. CAIR officials are not so quick to rule out the possibility that the killer’s motive may have been hatred for Islam and Muslims.